I know I'm too late for all my Canadian friends' Thanksgiving, but we still have Christmas and other family events happening, right?!! This recipe is my default for Holiday gatherings and potlucks when I can't think of anything spectacularly creative; and I really don't know why I ever bother with anything else - they're always a hit. 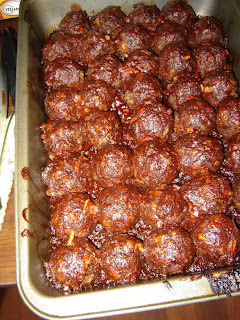 Covered with BBQ sauce, sweet-and-sour sauce or gravy, these No-Meat Balls are usually finished before the turkey! Preheat oven to 350°F. Mix all ingredients together in a medium bowl. Squish mixture together with your hands or a potato masher. If it's too dry and doesn't stick together, add a bit more liquid, if too moist, add some breadcrumbs or gluten flour. When you've gotten the mixture into a "roll-able" consistency, form into small balls. Place on a greased cookie sheet. Spray or mist a bit of oil over the top of the balls for a more crispy texture. Bake for 30 minutes until browned and firm. Line up the meatballs in a 9 X 13 casserole dish. Pour sauce of your choice over meatballs - marinara, gravy, sweet-n-sour or BBQ sauce. Warm in oven to let sauce thicken a bit, and serve. Ha, this is weird! I need to talk to you, too, Marti! Have you ever done home made Saurkraut? I want to do some and I read the instructions (I have Wild Fermentation by Sandor Katz) but am a little, well, nervous. Email me or just respond here or hop over to VF. Whatever is easier. Super super yum Martï ! Your recipes always work ! I am going to make these this week!! I was wondering is there anything you can use besides wheat germ? Like ground flax seed or something? Oat bran, or garbanzo flour both work pretty well instead of wheat germ, - I think ground flax would work well too - I should attempt a GF recipe from this, I think it's totally do-able! I made these for dinner tonight. YUM! Thanks for another great recipe, I love that I can still have meatball sandwiches. :) My son loved this, too!